PHILADELPHIA (WPVI) -- TONIGHT: Partly cloudy, cool. Lows 51-54. SUNDAY (EASTER): Some morning sunshine, giving way to mostly cloudy skies by afternoon. Spotty shower is possible. High 68. MONDAY: Mostly cloudy with showers. High 68. 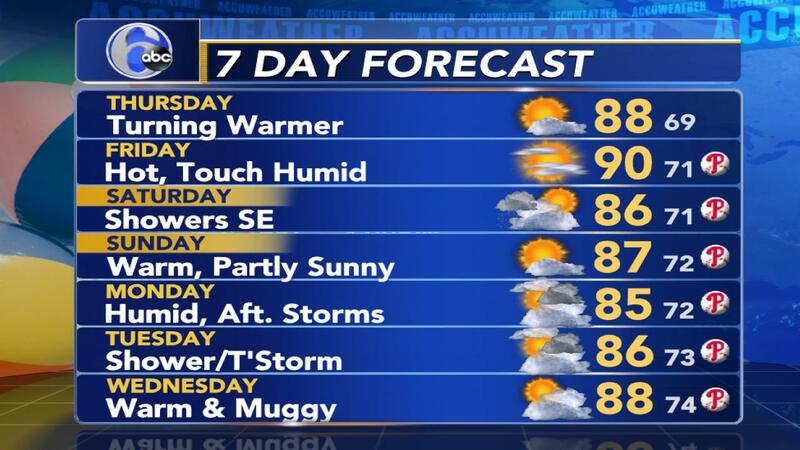 TUESDAY: Partly sunny, very warm. High 80. WEDNESDAY: Partly sunny. A stray shower is possible during the afternoon (mainly north and west). High 77. THURSDAY: Mostly cloudy and cool, with showers during the afternoon. High 66. FRIDAY: Clouds, limited sun. Showers and thunderstorms are possible during the afternoon. High 70. SATURDAY: Partly sunny, breezy. High 71.